PULZAR LONG LIFE For NGV is a premium engine oil for the lubrication of the crankcase and power compressor cylinders of spark-ignited, two and four-cycle gas fueled engines. It is formulated to provide exceptional control of deposits, wear, oil oxidation and oil nitration in the compressed natural gas fueled engines. It contains premium low ash natural gas engine oil additive package that help extend life of the engines. Oxidation and nitration are common causes of oil thickening in gas fueled engines. The premium additive package and high quality base stocks in PULZAR LONG LIFE for NGV provide excellent dispersing characteristics and good high temperature detergency to reduce deposit formation due to nitration and to ensure minimal carbon and ash deposits during service. PULZAR LONG LIFE for NGV is suitable to most gas fueled engines especially the one that requires a low ash engine oil. This oil meets the performance requirement of major engine manufacturers such as Cummins B&C series engines as well as Detroit Diesel Series 50 and Series 60 engines. It is recommended for heavy duty engines powered by CNG/NGV. 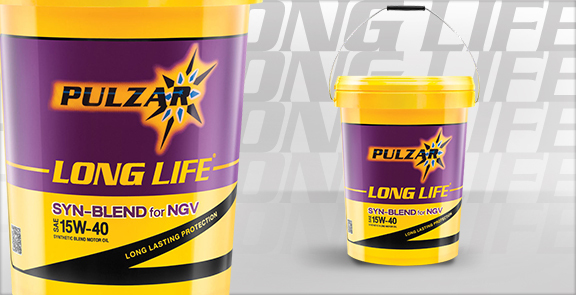 PULZAR LONG LIFE for NGV is available in SAE 15W-40.